These sliders are a perfect portion for young children with small appetites and to have on hand for after school snack time. Brush onions and tomatoes with oil. Grill 2 min., turning tomatoes after 1 min. Remove tomatoes from grill. Grill onions 6 min., turning after 3 min. Cool. Meanwhile, mix meat and oregano; shape into 8 (1/2-inch-thick) patties. Grill 3 to 5 min. on each side or until done (160ºF), topping with Singles pieces and adding buns to the grill to toast for the last 2 min. Chop onions and tomatoes; place in medium bowl. Add vinegar and lemon juice; mix lightly. 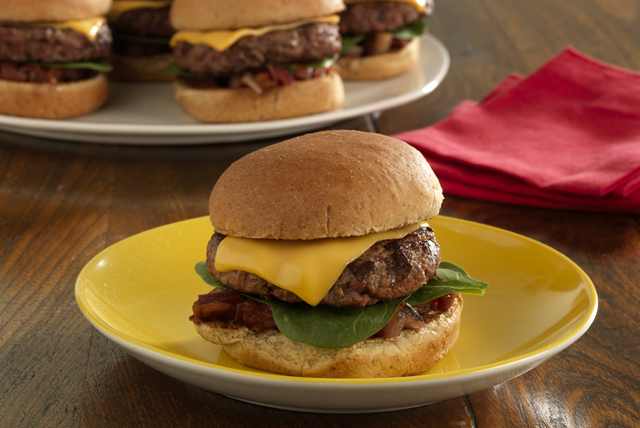 Spoon onto bottom halves of buns; cover with spinach, burgers and tops of buns. When cooking the entire meal on the grill, plan ahead so that fast-cooking foods are added to the grill last. It's okay if the meat is done before the other foods. Just place it on a clean platter, then cover with foil and let it stand up to 10 min. or until the other grilled foods are done. Standing allows the meat juices to be absorbed into the meat, resulting in better flavor. Prepare as directed, omitting the dried oregano, substituting ground pork for half the ground beef, and mixing 1 grated apple and 1 Tbsp. chopped fresh oregano with the meat before shaping into patties. Your kids will love these burgers that are just their size. Let them choose all their favorite toppings.